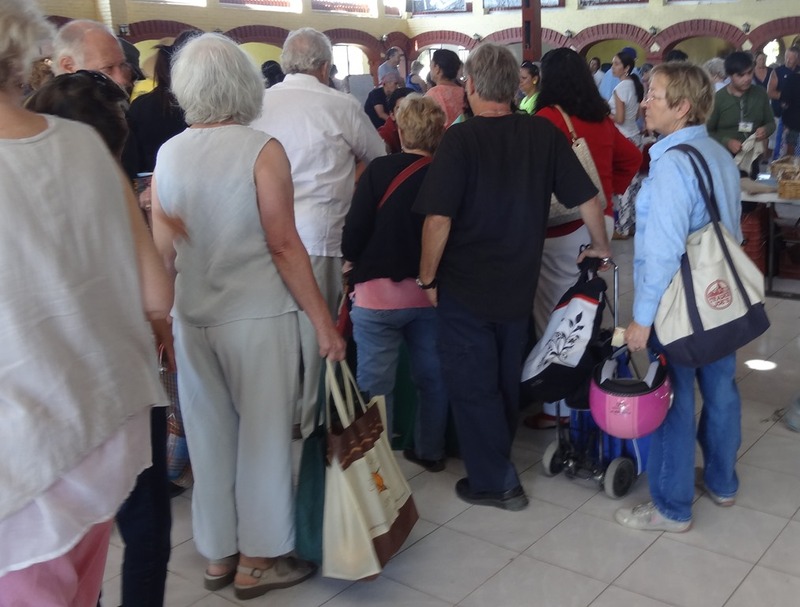 We continue to have ‘newbie’ experiences here in Ajijic, and I keep writing about what it is like for our naive eyes. One of these things is the weekly organic farmer’s market. As I explain below, this would have been of some interest a few months ago, but now, it is much more important. I am getting older. Last year, a few months ago, I had the worst series of medical issues I have faced so far. I had about three months of infections and other ailments that left me not feeling well. After I started to recover and feel good again, I very much wanted to keep feeling good. So I was convinced see the Ayurvedic practitioner Carol had found in Tiruvannamalai, Peter Malakoff. Peter told me that basically I have a strong constitution (he called it “big Agni,” — big “fire”). But this changes as we age. And that the various health issues I had been having for the last few years came from this change. I needed to make big changes to what and when I eat. So I have mostly stopped drinking alcohol, and have mostly stopped eating meat. Beyond this there are many foods that, because of my body’s tendencies, I just should not eat (like milk, tomatoes, oranges, meat, spicy foods, the list goes on and on…). And there are some things that I really must have, including dark greens and other “bitter” foods. I joke that my dietary rule now is if I have eaten it all my life and really liked it, then I can’t eat it anymore. Naturally this complicates life. I am figuring what to do when we eat out at one of the many great restaurants here. (There is meat everywhere!) 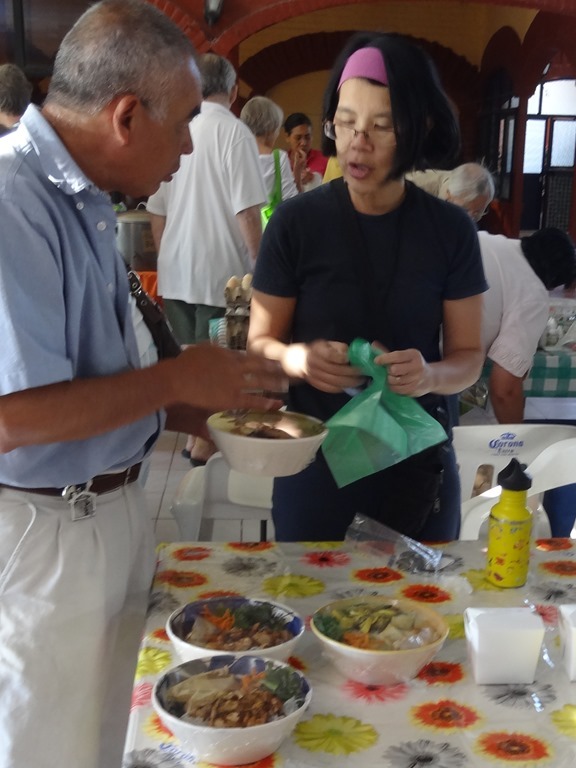 But it is most important to be able to make healthy meals at home. 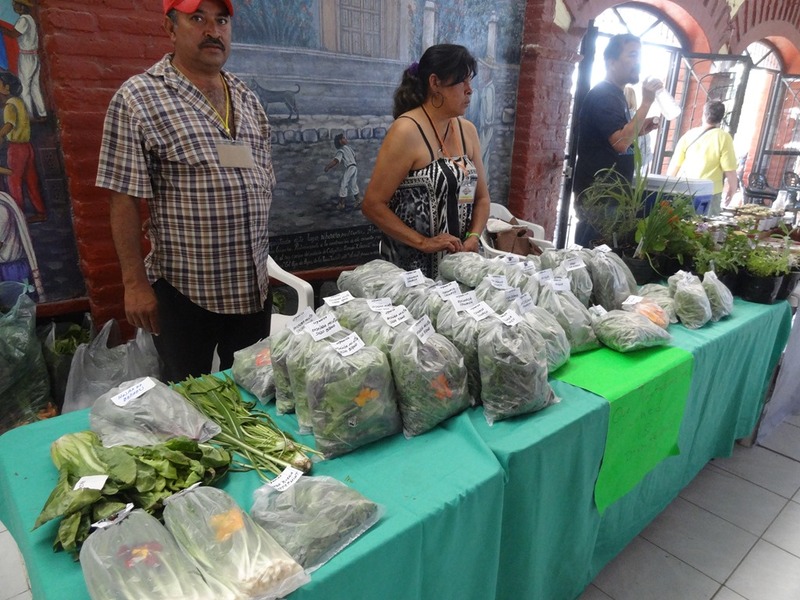 So we are VERY interested in what we have heard about this weekly organic market. We drive our new motorbike out west of Ajijic. We don’t know just where it is and we ask a gringa lady walking down the street. She points just up ahead. We are almost there. 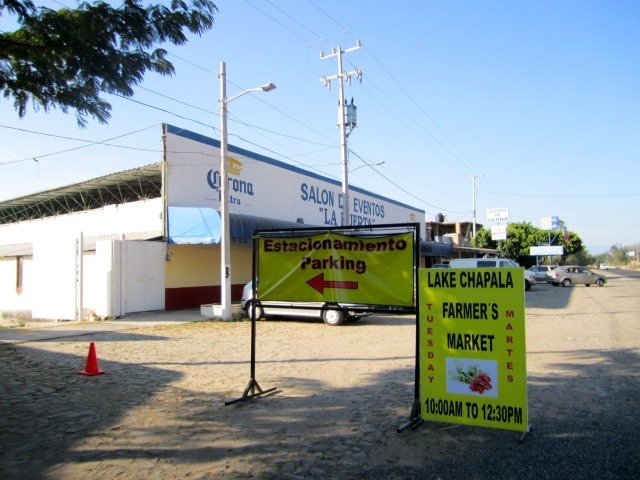 I was too busy driving the motorbike to take an ‘approach shot,’ so here is one from www.accesslakechapala.com. 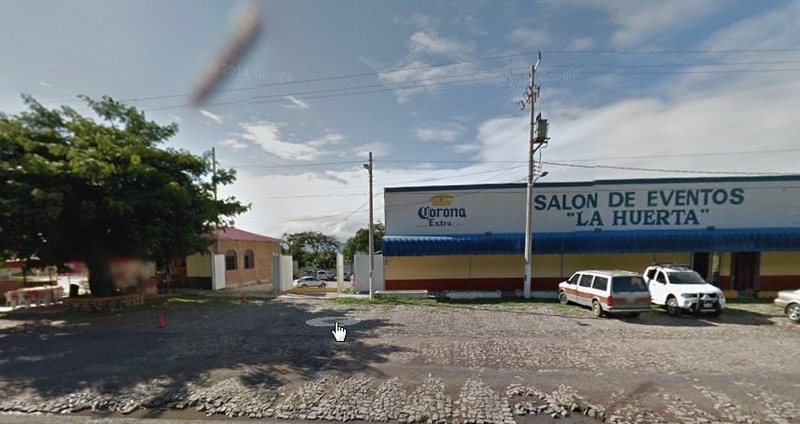 The market is behind this building, shown below from Google Street View. 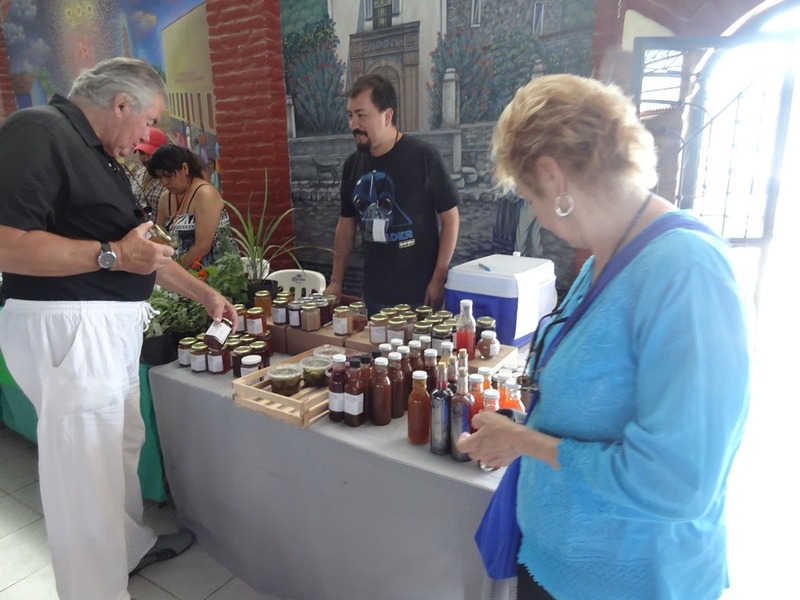 This is the Salon de Eventos La Huerta. 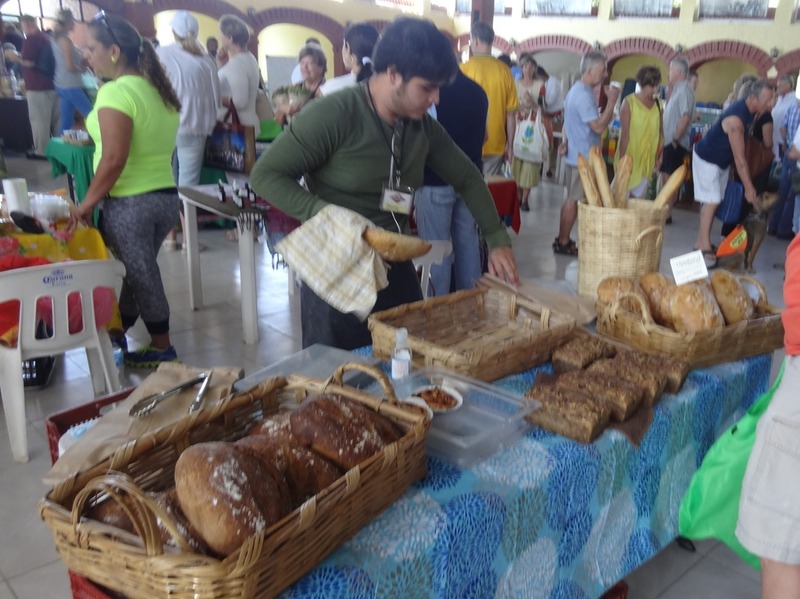 The first thing that surprised us was that the market was inside a building. We expected it to be out on the street. The next thing I noticed was that many different things were being offered. 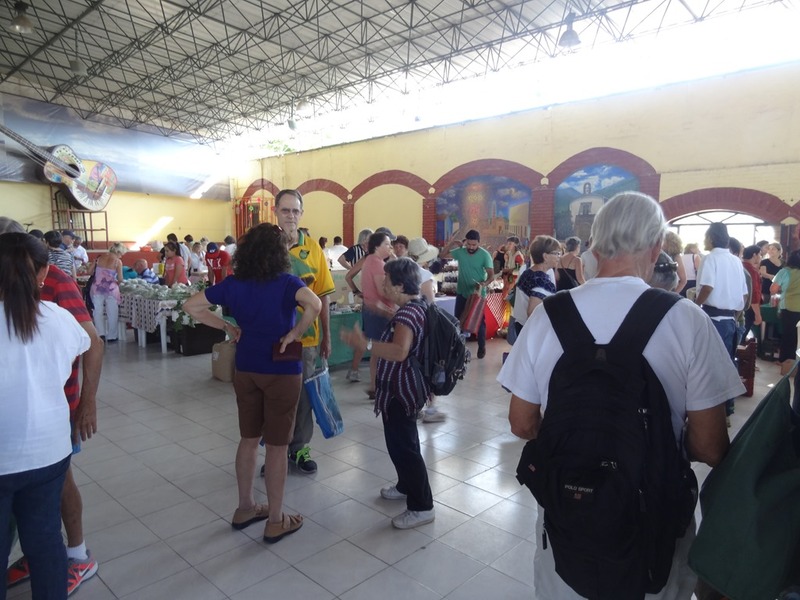 Besides food, there were various prepared items like bread and jam, various health concoctions, and even clothes and jewelry. 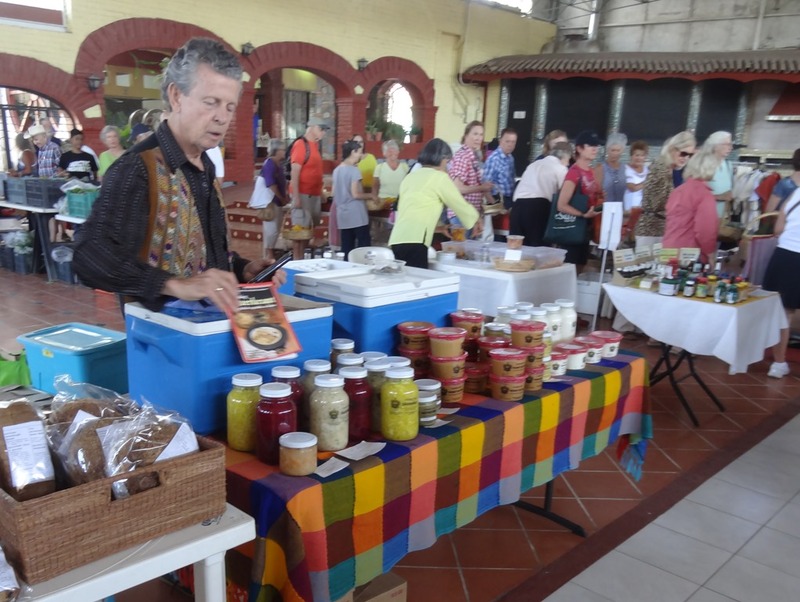 I think this man is offering jars of organic sauerkraut. Soon we found my heart’s desire, fresh tender organic kale. I should eat this two or three times each week. 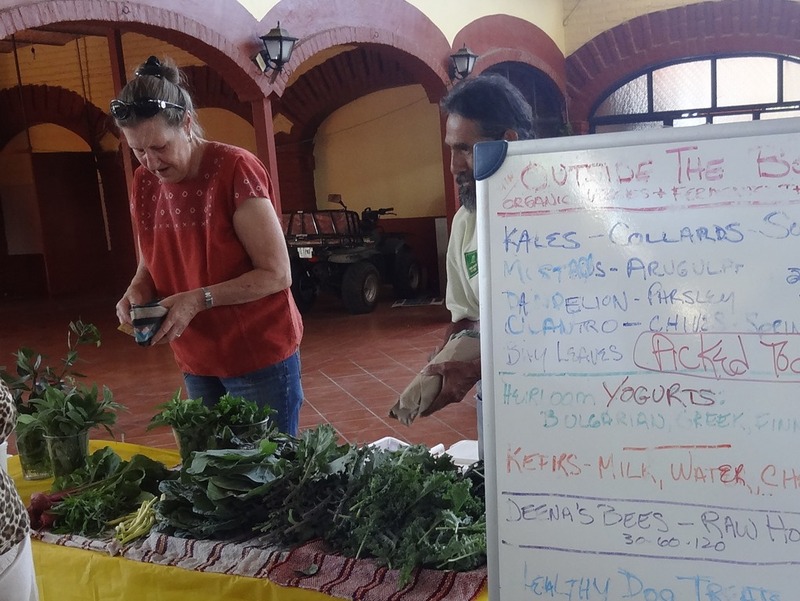 How often do you see kale offered in a restaurant? (Well, it’s all over the place in Los Angeles, but that’s another story.) It surprises me that the thing I look forward to the most is kale! 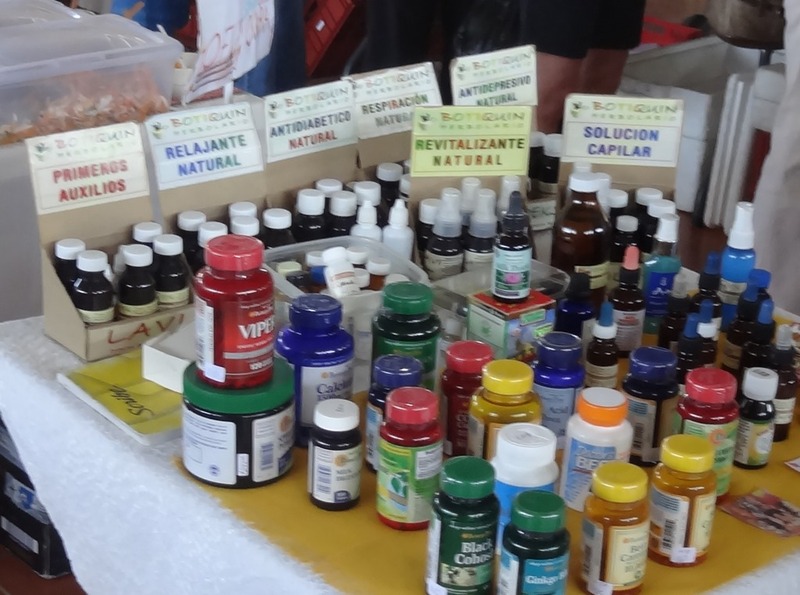 Here is a table of natural healing products. There is quite a lineup at this stand, two lines that stretch back into the hall. 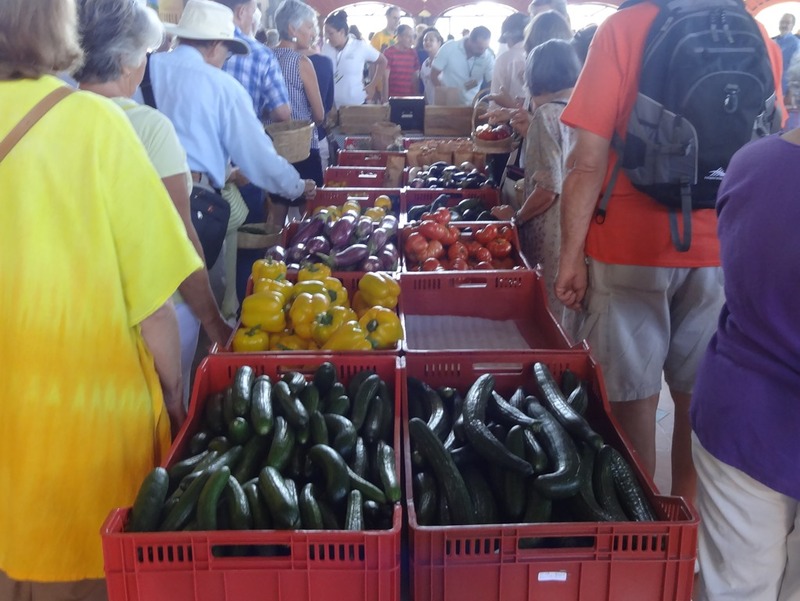 Offered here are a wide variety of organic vegetables; zucchini squash, yellow bell peppers, etc. I see that one bin is empty, I guess sold out already. 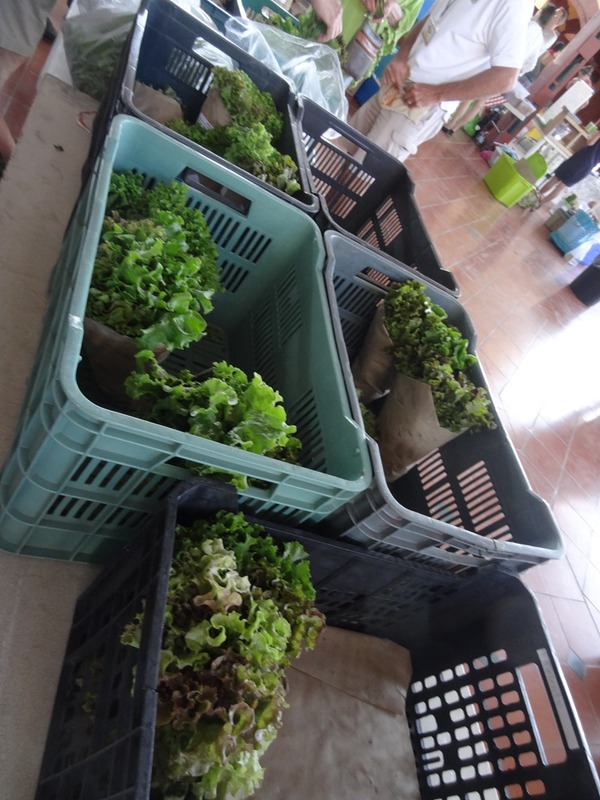 Big bins of organic lettuce. In India we could only buy small bags of “salad,” mixed small leafy greens. 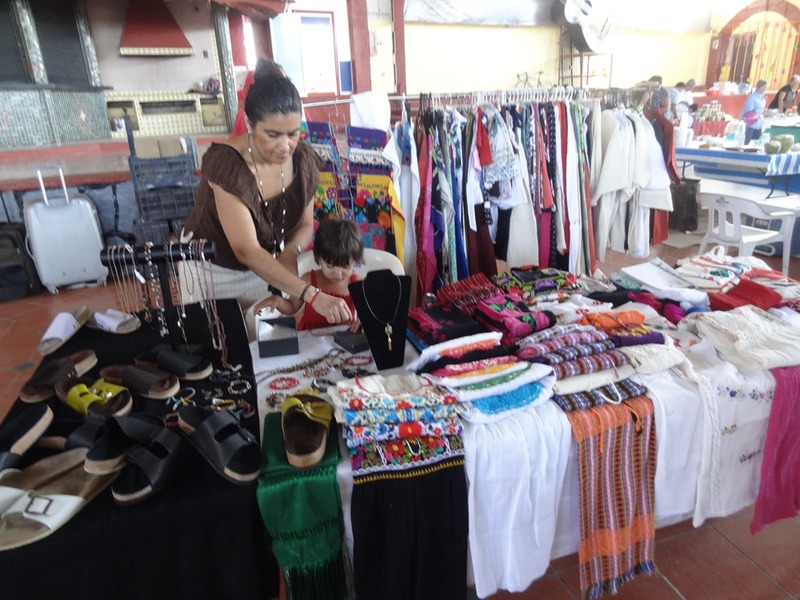 Clothes, sandals and jewelry. I bet the clothes are all cotton. 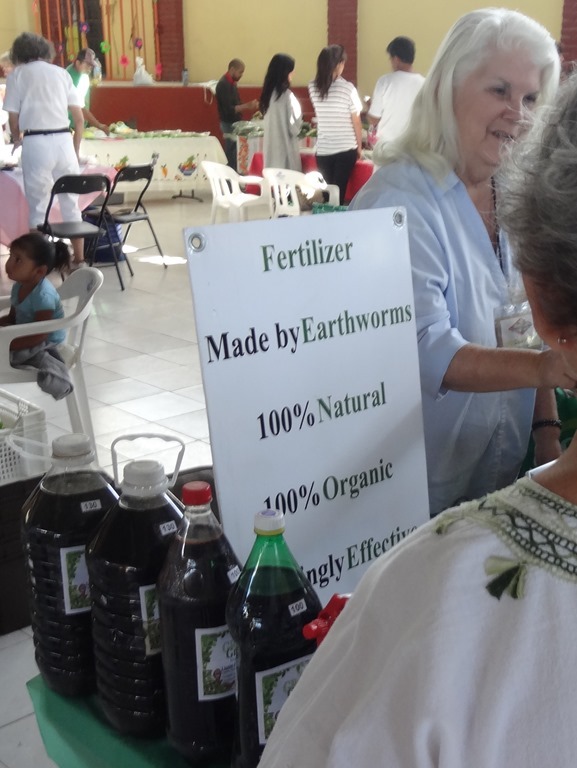 There is a white-haired lady selling organic earth worm fertilizer, so you can grow your own organic produce. 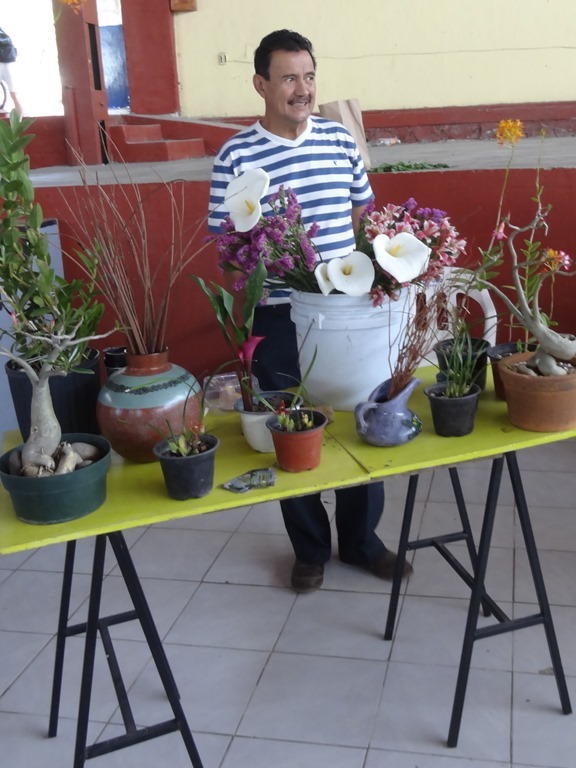 A Mexican man with decorative plants. 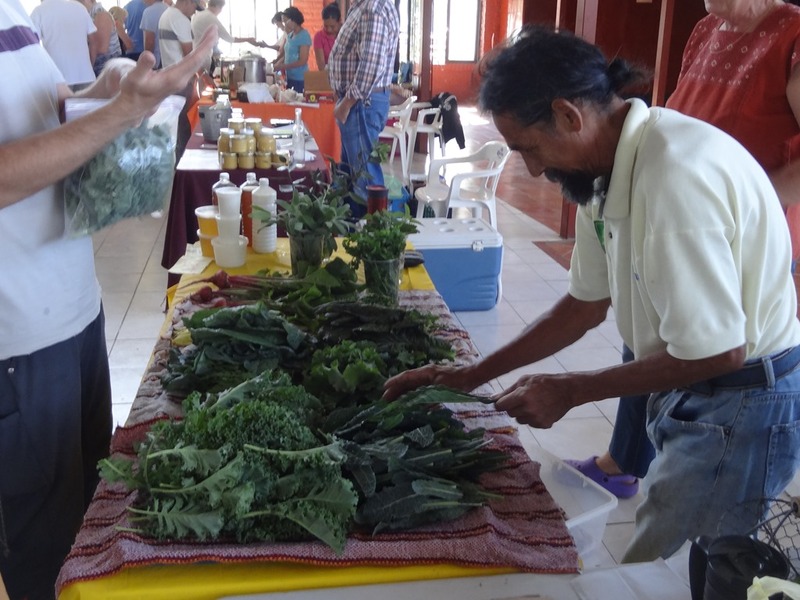 While some of the vendors are Mexican, many growers of organic produce are gringos. 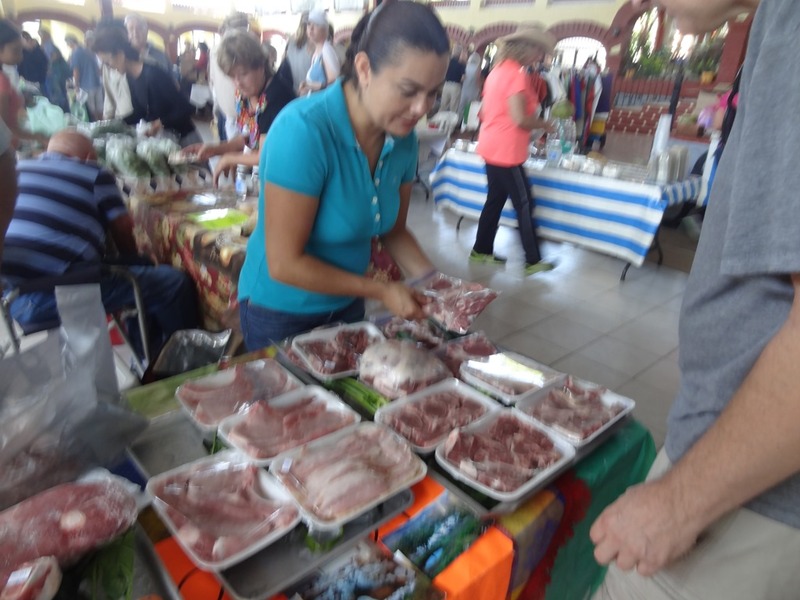 A woman sells various cuts of fresh lamb meat that she has raised carefully, so it is the highest quality. 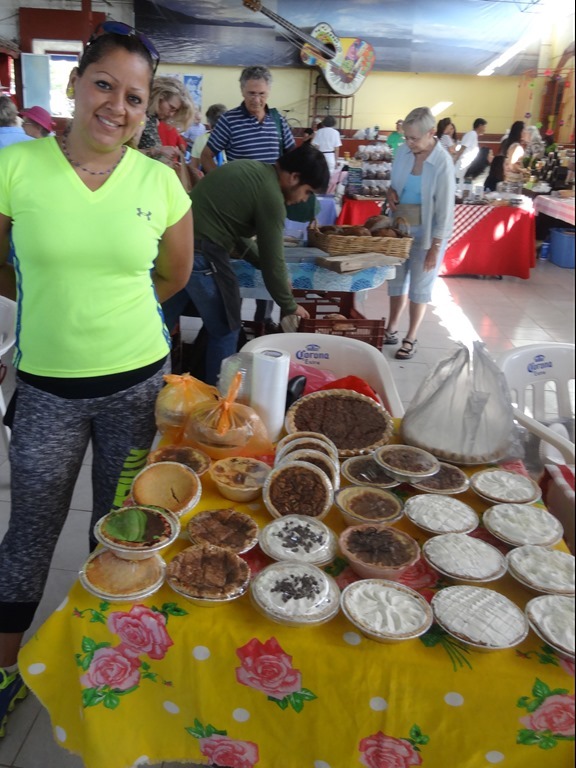 This woman owns a bakery near the main square. Anyone know its name? 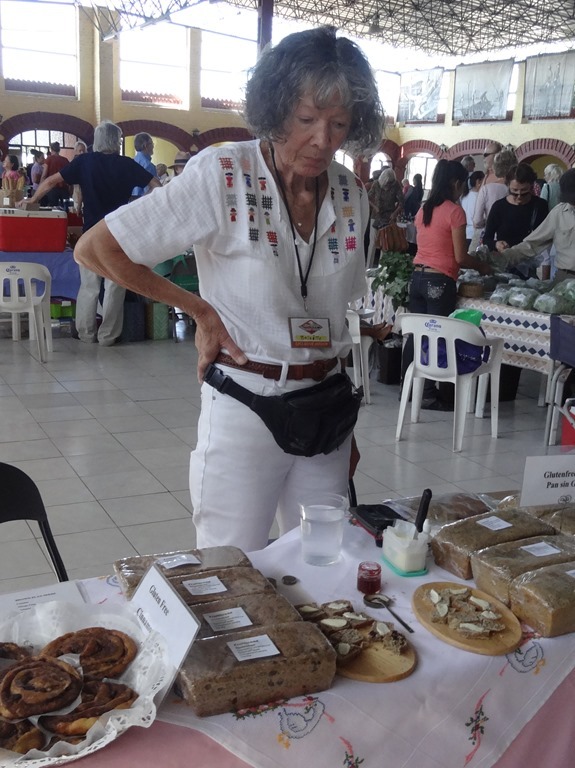 She makes some of the best breads I have ever eaten. 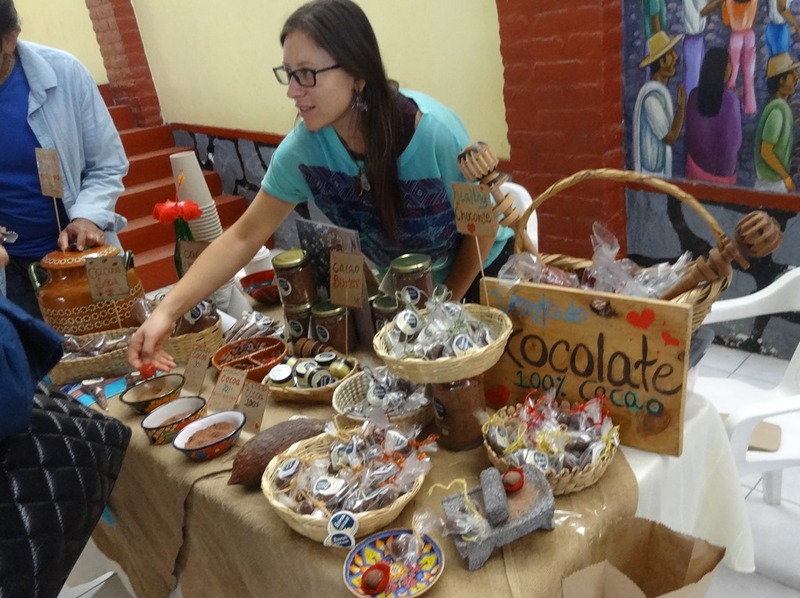 Homemade organic chocolates. Another food I am not supposed to eat anymore. 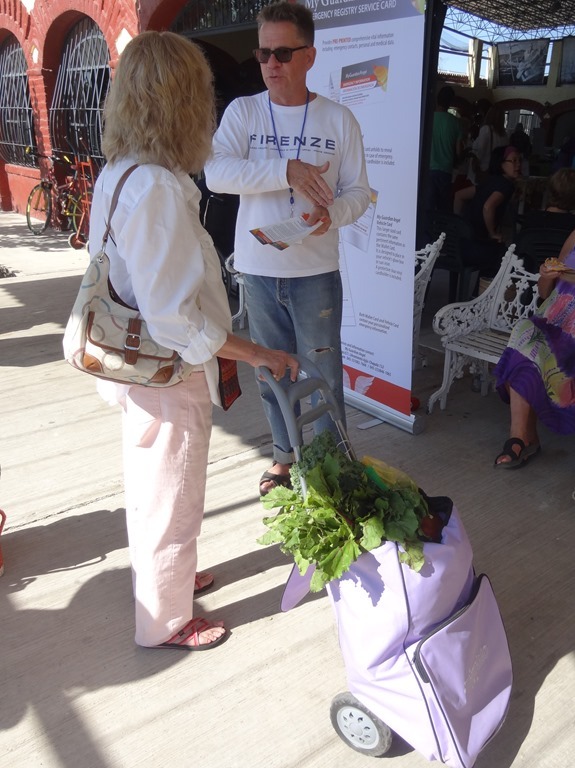 Bagged veggies, ready to carry out. More fresh greens, nicely laid out. 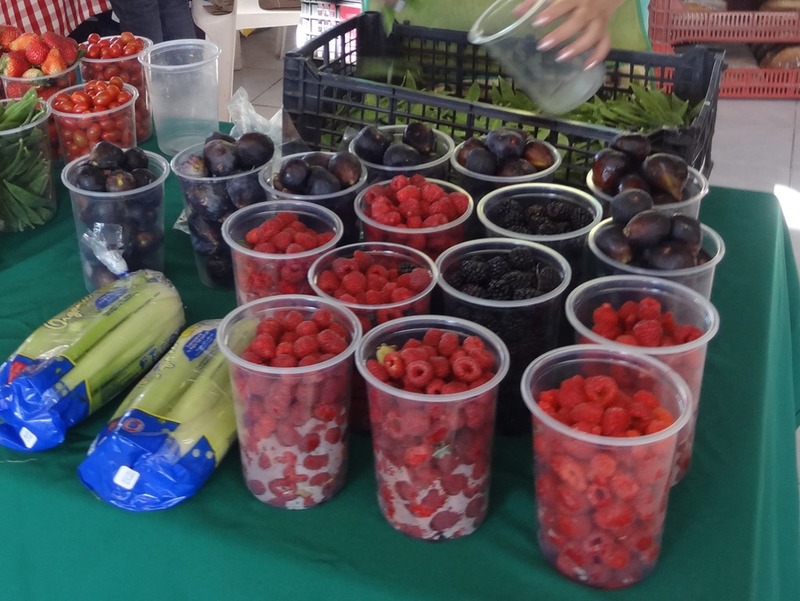 Raspberries, blackberries and fresh figs. Carol has a thing for raspberries that goes back to her childhood and one of her grandmothers. Wait till she sees this! 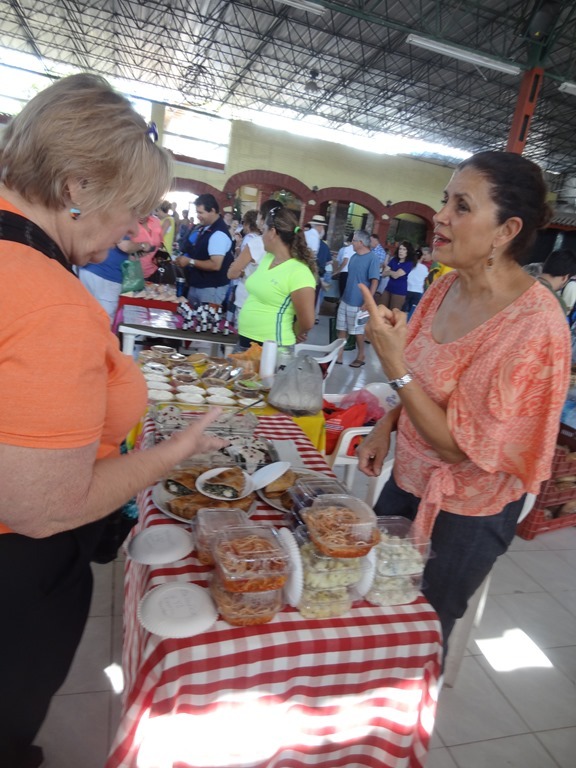 A woman offers take-out dishes, ready to eat. Look at the table of little pies! Anyone got a sweet tooth? 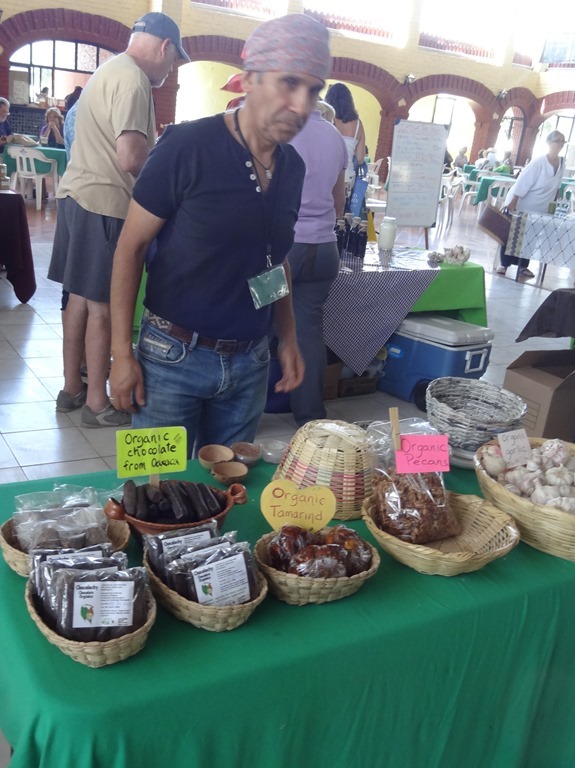 Organic chocolate, tamarind, nuts and garlic. More wonderful greens, kale and collard greens. These bitter greens have become such a big part of our diet now. I am so happy that they are available here in Ajijic. 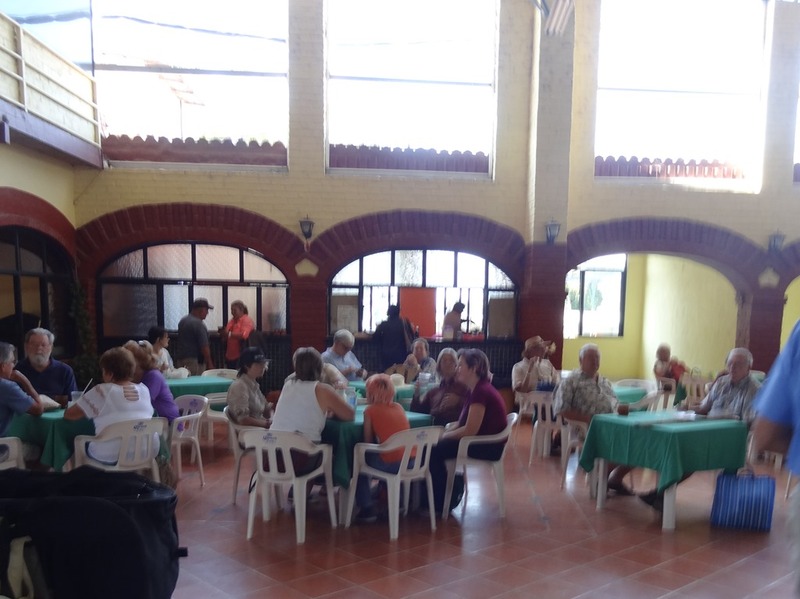 There is an area set out with tables and chairs to sit and talk and to eat some of the dishes that are sold here today. This looks like a table of sauces and jams. Carol braves the line to buy some of those raspberries. I knew she would. She carries her pink motorbike helmet. One nuisance about them is that you have to carry them where ever you go when you are off the bike. If you are interested in this market, get there early. 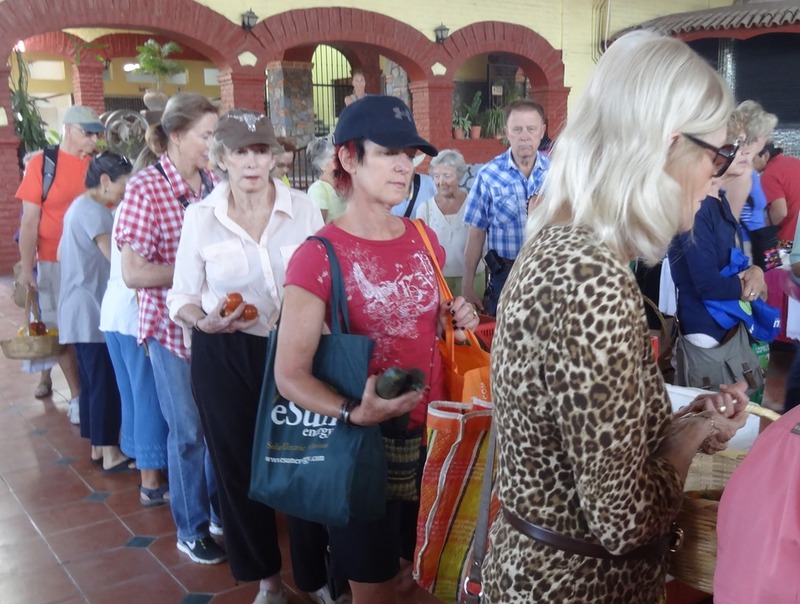 It opens at 10 AM, and things sell out fast, especially during the ‘season’ when so many visitors are here. This lady with her overflowing roller cart bag is an example of the shoppers here. This market is open only one day each week, so you have to stock up. Here is a map. 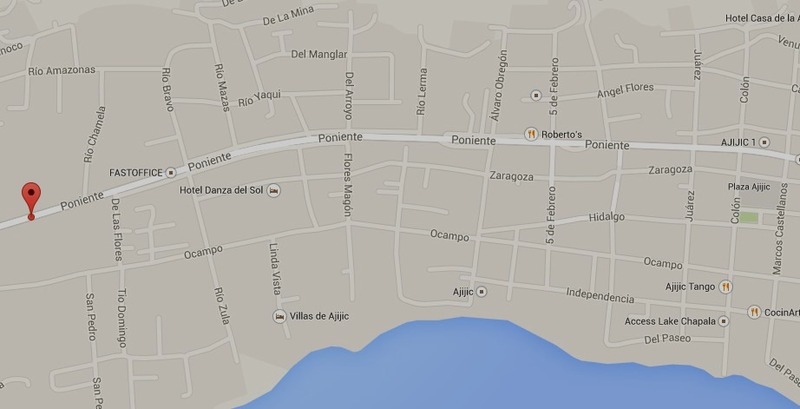 It is on the main road, about 1.5 miles west of the central Ajijic plaza. I know this will become a regular stop in our week’s routine. What you can find here is so important to our nutrition and health. I am so happy that it is here. 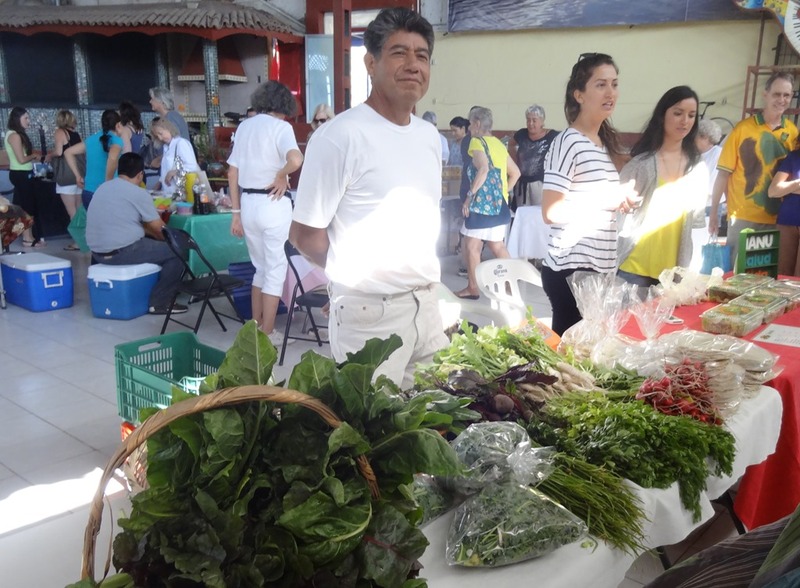 There are several other farmer’s markets on other days of the week. But this has the best organic produce, and the best dark greens. 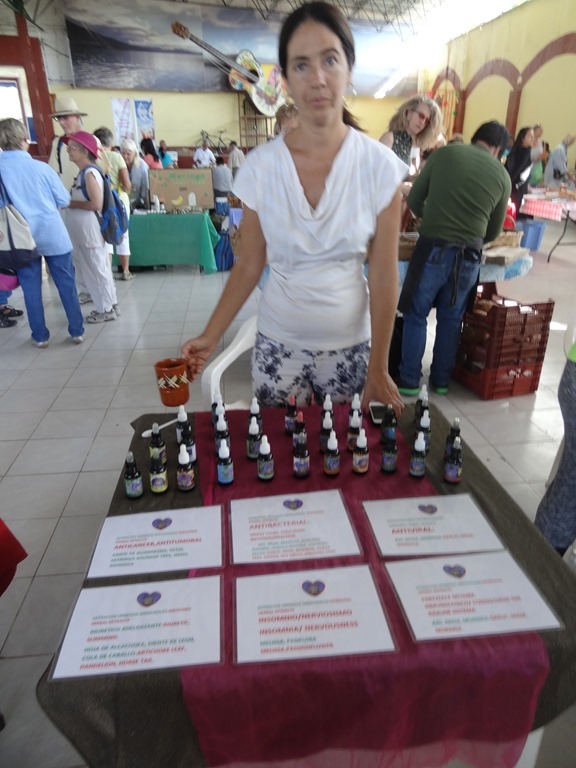 There are a number of good bloggers who cover Ajijic. Here are links to some othe posts on this market. This entry was posted on April 26, 2015 at 7:31 pm and is filed under Ajijic. You can follow any responses to this entry through the RSS 2.0 feed. You can leave a response, or trackback from your own site. I am in Thiruvannamalai now and wanted to meet you here.But I think you have already moved.Hope to see you someday in person. Sorry to miss you in Tiruvannamalai. I’m so glad to see that you finally connected with Peter Malakoff! I came across his blog last year just by accident and we have communicated a bit back and forth. (I emailed Carol to see if you guys knew him). Really interesting guy…very smart. Looks like he gave you some excellent advice. Judging by your last picture, it’s working. So happy that you can keep up with the new diet so far. I am feeling good again, every day. Yeah, well to keep to that strict a diet would be very difficult indeed! Glad you’re feeling good! I read in one of the other blogs that the fresh eggs sold at the market are great. Can you have eggs? KIND OF, no yolks. But I still have them anyway.